All Non European nationals are required to obtain entry visa for the UK unless you are joining your British spouse. An Entry Clearance (visa) Officer will decide if you qualify for entry before you can travel to the United Kingdom. If you have a valid UK visa you will not normally be refused entry to the UK unless your circumstances have changed, or you gave false information. You can apply for the UK visa online if you are a resident in the UAE, or submit the necessary forms personally at the British embassy in Abu Dhabi or at the British Consulate in Dubai. 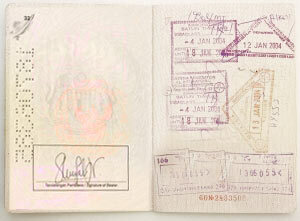 · Your valid passport or travel document with at least 6 months validity remaining. Applicants should ensure that there are sufficient pages in the passport to allow for the visa entry. · Any other supporting documents requested in the guidance note. In addition to the above, the British Consulate in Dubai requests photocopies of all documents submitted in support of an application. In line with international practice, when children under 18 years are travelling alone or with only one parent, a ‘no objection letter’ is requited from the parent (s) who are not travelling, giving permission for the child to be taken abroad. If you are a UAE national or hold a valid UAE residence permit and have travelled to the UK, USA, Canada, Australia, New Zealand, Switzerland or Schengen countries in the last 5 years (or you are the dependant or domestic worker of someone applying in the above category) you may send a representative to the Embassy to apply on your behalf. You may also use the drop box facility mentioned below. All other applicants must attend in person. If you meet the above criteria, and are resident in the UAE, you may submit your applications via the drop box at the British consulate in Dubai, either through a travel agent, courier, representative, or in person. The drop box will be open to accept applications between 1100hrs - 1245hrs, Sundays to Thursdays. Please check that you meet the criteria, and that you have enclosed the application form, 1 recent passport photograph and full supporting documents. Applications must be accompanied by the correct fee in the form of a signed bank draft made payable to "British Embassy, Dubai". Cash is not accepted for dropbox applications, and only one banker's draft per application or family group is accepted. Please note that sealed envelopes will not be accepted. In order to meet EU requirements, the United Kingdom now issue entry clearance vignettes (visas) that incorporate a photograph of the holder. Each individual person listed on a passport is therefore issued with a separate visa.. For example, a parent who has dependant children on their passport will be issued with a separate visa for each person travelling and will require a blank double-sided page per person for this purpose. ABU DHABI UK Visa Application Centre Office No 1, Level O2 Khalidya Tower 1st Zayed Street (Al Khalidya Street) Al Khalidya Area Abu Dhabi - UAE. DUBAI UK Visa Application Centre Office No. 5, Level 7 Bur Juman Centre Office Towers, Sheikh Khalifa Bin Zayed Road (Trade Centre Road) Bur Dubai Dubai - where you should submit your application and your biometric fingerscans. HELPLINE NUMBER: +971 2 6342530 (centralised contact centre for UAE in Abu Dhabi). Helpline Operating Hours: 0900 to 1700 Hrs - Sunday to Thursday. Website: www.britishembassy.gov.uk and click on "Services"